Disability is not a characteristic of an individual; rather, it arises when people with health conditions or impairments experience socially constructed barriers that limit their everyday activities (Oliver 1990). In the UK, the term ‘disabled person’ is generally used, in line with the disability rights movement, which recognises disability as a form of social oppression that is external to the person. In this conception, a person is not a ‘person with a disability’ because they do not own the disability; instead, it is imposed on them by a disabling society. This differs from the terminology used by the ‘People First’ self-advocacy movement (www.peoplefirst.org), however, which advocates the use of the term ‘people with disabilities’. In 2016-17, 13.9 million people in the UK reported a disability, equating to almost one in five of the population (Department for Work and Pensions 2018). There is considerable evidence that disabled people experience suboptimal health compared with non-disabled people, including in aspects of health that are unrelated to their disability (Emerson et al 2009). Disabled people are at increased risk of having a lower income, greater financial and employment insecurity, and suboptimal housing, which are all associated with suboptimal health outcomes (World Health Organization 2008). Despite their greater health needs, disabled people experience several barriers to accessing services (Equality and Human Rights Commission 2017), including required healthcare (Dinsmore 2011, Ali et al 2013, Tuffrey-Wijne et al 2013, 2014, Sakellariou and Rotarou 2017). Such barriers include: structural issues related to physical access into buildings and a lack of transportation; financial barriers, including the affordability of medicines; and cultural and attitudinal barriers such as misconceptions about disability, and disabled people feeling that their needs are not understood (Sakellariou and Rotarou 2017). A systematic review by Gibson and O’Connor (2010) concluded that disabled people are restricted in accessing healthcare and report less satisfaction with their medical care compared with the general population. It is essential that all healthcare professionals, including nurses, are able to anticipate and support the holistic needs of disabled people across a range of healthcare settings. In the 1970s, the humanistic nursing theory developed by Paterson and Zderad (1976) proposed that, to care effectively for a patient and develop the optimal care strategy, the nurse needs to connect with them interpersonally. Some of the principles of humanistic nursing theory were further developed by Watson (1979), whose theory stated that holistic healthcare is central to the practice of caring in nursing. The patient should be the focus of practice, with consideration given to the context in which they live, including their family, community and culture. The humanistic approach to nursing care is evidenced in person-centred practice, with each patient being assessed and treated on an individual basis, and their care being centred on their needs rather than the needs of the service. The Equality Act 2010 is the legal framework supporting disabled people accessing public services in the UK, including healthcare services. The act sets out a duty for public services to make reasonable adjustments, as far as possible, so that disabled people are not disadvantaged in using these services. It applies to people who are placed at a ‘substantial disadvantage’ compared with non-disabled people because of their disability, with ‘substantial’ defined as more than minor or trivial. The duty to provide reasonable adjustments is anticipatory, meaning that health and social care professionals should consider in advance the type of adjustments disabled people require, either collectively, such as the provision of accessible toilets or easy-read information, or individually, such as changing the length of a person’s appointment so that they can communicate easily. Box 1 outlines the ways in which reasonable adjustments may be provided, in accordance with the Equality Act 2010. Reasonable adjustments are intended to overcome the disadvantage disabled people experience in accessing and receiving effective care. Therefore, the adjustments made must enable a disabled person to receive the same level of effective care that is provided to other patients. Adjustments must be made only if it is reasonable to do so. What is defined as reasonable depends on several factors, including: if the change requested would address the disadvantage that disabled people experience; the practicability of making the changes; the size of the organisation; the cost of making the changes and the resources available for this; and whether any changes have already been made. Disabled people should never be asked to pay for reasonable adjustments. It is important to distinguish between what constitutes ‘effective practice’ in relation to nursing care, and what constitutes ‘reasonable adjustment’ for a disabled person. Effective practice should be expected by all patients and requires nurses to adhere to the recognised methods of providing person-centred care for patients, for example providing appropriate food and support to eat it if required. Reasonable adjustments build on the expectations of effective practice to ensure that disabled people are not disadvantaged. For example, if a disabled person cannot understand a standard menu, a reasonable adjustment might involve providing the menu in an easy-read format to enable the person to make food choices in the same way as other patients. • Enable participants to fully understand hospitals’ legal obligations to provide reasonably adjusted care for disabled patients. • Share examples of reasonable adjustments within hospital trusts, and discuss the circumstances of their development, implementation and appraisal. Although the University of Bristol study concerned reasonable adjustments for all disabled people, most of the examples shared at the workshops related to the provision of reasonable adjustments for people with learning disabilities. This article outlines two examples of system-level reasonable adjustments and one example of an individual-level reasonable adjustment that were discussed at the workshops. The article has been written collaboratively by the research team and some of the workshop participants. The authors discuss the main facilitators of the adjustments, and how these relate to nursing practice. All patient names have been changed to maintain confidentiality. System-level reasonable adjustments are implemented when health and social care service providers have planned and taken a strategic approach to addressing the barriers that could potentially impede disabled people from accessing a service. Therefore, these adjustments are available to all disabled people and embedded in the health and social care system. Such adjustments include wheelchair-accessible reception desks; the easy availability of accessible information about health conditions; colour-coded signage; 24-hour access to interpreters; or the use of ‘health passports’. Health passports include all the information required to support an individual in hospital, including their likes, dislikes and method of communication. They are designed to enable healthcare professionals to provide appropriate, person-centred care to the individual. The first example of system-level reasonable adjustments presented in this article was made by the Bristol, Bath and Weston abdominal aortic aneurysm (AAA) screening programme. An AAA is a bulge or swelling in the aorta, the main blood vessel that runs from the heart down through the chest and abdomen. The aneurysm can increase in size over time and could rupture, causing life-threatening bleeding. Men aged 65 years and over have the highest risk of AAA (UK National Screening Committee 2014). The NHS AAA screening programme is available to men aged 65 years and over in England. Eligible men are identified through GP registers. Although it is a national screening programme, local areas have some flexibility as to how the programme is delivered. The Bristol, Bath and Weston AAA screening programme became aware of the need to do more to adjust services for men with learning disabilities, since locally collected evidence suggested that the uptake of AAA screening for people with learning disabilities was lower than that for other men (Turner et al 2013). The screening programme collaborated with local learning disability services to establish a reasonably adjusted care pathway and policy, and to develop an easy-read AAA leaflet. Partnership working was essential to the success of the screening programme. Learning disability nurses provide training for screening programme staff, work with health and social care professionals to confirm informed consent from men invited for screening, and ensure the provision of reasonable adjustments where necessary, such as desensitisation to the environment. Screening programme staff are invited to a range of settings, such as day centres, to increase men with learning disabilities’ understanding and awareness of the AAA screening programme. Future plans include training for screening programme staff in basic Makaton (a language programme that uses signs and symbols to assist people to communicate, which is mainly used with people with learning disabilities), and working with the national AAA screening programme to develop YouTube videos with and for people with learning disabilities to explain the screening process. The second example of system-level reasonable adjustments presented in this article was shared by the bowel screening programme in the North East and Cumbria Learning Disability Network. Local data indicated that the national cancer screening programmes had low uptake by people with learning disabilities, which led to the establishment of the North East and Cumbria Learning Disability Network Cancer Project, initially funded through the Accelerate Coordinate Evaluate (ACE) programme, and then Macmillan Cancer Support. One focus of the project was to address the low uptake of bowel screening among people with learning disabilities. The group developed a pathway that identifies, ‘flags’ and offers support to people with learning disabilities, then invites them for screening. In the project’s first year, 64 people with learning disabilities from one Clinical Commissioning Group (CCG) were identified through an additional care needs flag on the bowel cancer screening computer system, and were offered support from the community learning disability team before the screening. Of these individuals, 32 (50%) people with learning disabilities accepted support from the community learning disability team and 16 (25%) individuals stated they already had support from carers or family to understand the information. Of the 39 (61%) people with learning disabilities who completed the screening, nine of them had not completed the screening when they were previously invited; some had received multiple invites over several years, to which they had not previously responded. In one CCG, seven people with learning disabilities were known to the bowel cancer screening hub before the project; there are now 209 people with learning disabilities flagged on the bowel cancer screening computer system. The partnership working required for the project to be a success has been extensive, and coordination has been essential across a range of healthcare commissioners and providers, including community learning disability teams and primary care liaison nurses. Learning disability nurses were fundamental to the success of the project and its progress, particularly in offering individually tailored, person-centred support to people with learning disabilities. For example, one person with a learning disability, Jack, had submitted samples for two bowel screening tests but had not completed the documentation fully. When asked to submit a third test kit, Jack refused. The project staff visited Jack and discussed the benefits of screening using easy-read materials. Jack was supported to complete another test kit, which he did successfully. Individual-level reasonable adjustments are specifically tailored to a disabled person’s needs. The need for an individual to have reasonable adjustments made to their care may be identified in a discussion with the individual, or on their behalf by a healthcare professional, for example in a GP referral letter, or by a family member and/or carer. Once a person’s needs for reasonable adjustments are identified, the person’s hospital records may be flagged or formally marked to alert hospital staff of the need to provide the required adjustments. One of the examples of individual-level reasonable adjustments shared at the workshops was provided by the University Hospitals of Morecambe Bay NHS Foundation Trust and illustrated the role of a specialist learning disability nurse in coordinating the care of Eleanor, a person with learning disabilities, autism and complex needs. Eleanor lived in social care provision, would not travel in vehicles, and found healthcare service settings challenging. Eleanor developed a large, necrotic skin tag with a root into her buttock. The Mental Capacity Act 2005 requires that if a person is assessed as lacking capacity, a best interests decision-making process should be followed. Eleanor’s capacity was assessed, and it was determined that she did not have the capacity to consent to the social care provider taking a photograph of the skin tag to share with healthcare professionals, nor subsequently to agree on the treatment to be given. Therefore, the clinical nurse specialist for learning disabilities facilitated a series of best interest decision-making meetings. In these meetings, it was decided that Eleanor required surgery to remove the skin tag. It was also agreed that a full blood count, dental check-up and breast screening should take place at the same time as the surgical procedure because previous medical interventions had been challenging and distressing for Eleanor. A home visit was conducted by the consultant anaesthetist and surgeon, with support from the clinical nurse specialist, to meet and assess Eleanor, develop an admission plan with her family and carers, conduct a preoperative assessment, and complete relevant risk assessments. The surgical procedure was to be conducted in hospital under a general anaesthetic, but because Eleanor would not travel in a vehicle, a plan was developed to sedate and anaesthetise her at home before transferring her to hospital. On the day of the procedure, Eleanor was sedated and anaesthetised, and transferred to hospital via ‘blue light’ ambulance with hospital staff in support. She was immediately taken to theatre where all the agreed procedures and assessments were completed. Eleanor returned home in an ambulance, and the theatre team stayed with her until she fully recovered. Eleanor’s family and carers acknowledged how important effective planning was in ensuring the success of Eleanor’s treatment. 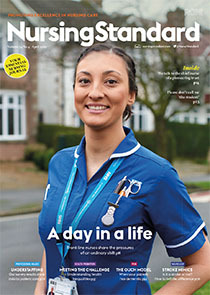 The clinical nurse specialist had an essential role, since he understood Eleanor’s needs, knew how the hospital systems worked, and was able to coordinate her care and ensure that all departments and health and social care professionals liaised with each other, and were clear about their roles and responsibilities. The leadership provided by the clinical nurse specialist ensured that, although there were several barriers to overcome, the focus was on how to overcome these, rather than using them as a reason not to provide appropriate care for Eleanor. The experience enabled other hospital staff to enhance their understanding of effective multi-agency planning and service provision, the legal requirement for the provision of reasonable adjustments, and how reasonable adjustments can be implemented. It is important for healthcare professionals to learn from examples of what has worked well, since these can provide inspiration and motivation, allow them to envisage what is possible and assist them in understanding how other services addressed an issue. It is also important to gain an understanding of how solutions were conceived, planned and implemented. Greenhalgh (2018) reflected that the healthcare system is complex, with ‘individual agents who have freedom to act in ways that are not always totally predictable, and whose actions are interconnected’. This complexity can be challenging; systems may stop working effectively when one part of the chain fails, for example when patients cannot be discharged from hospital in a timely manner because of pressures on the pharmacy department preparing their discharge medicines. Conversely, the provision of reasonable adjustments is possible precisely because nurses have the autonomy to respond to individual needs, and to decide with the individual, or those who know them best, how to respond to those needs. While the examples discussed in this article relate to people with learning disabilities, the same principles apply to all disabled people. There are several important issues that are relevant for nurses, such as: identifying those who are disadvantaged when using a service or under-represented in data about service use; the need to fully understand the issues experienced by disadvantaged individuals or groups so that appropriate adjustments can be designed; and the importance of collaboration and coordination in implementing successful reasonable adjustments. Box 2 outlines some recommendations for making reasonable adjustments to healthcare services, based on the examples discussed. In each of the examples of reasonably adjusted care outlined in this article, identifying individuals who were disadvantaged when using a service, or under-represented in data about service use, was essential. For example, both screening programmes identified the low uptake of screening among people with learning disabilities, while Eleanor was identified as a disabled person who required reasonable adjustments. Tuffrey-Wijne et al (2014) found that the lack of effective systems for identifying and flagging disabled people was a barrier to the provision of reasonable adjustments in hospitals. Disabled people might not always be identified as such on referral letters from GPs; for example, Public Health England (2016) reported that only around one quarter of adults with learning disabilities in England are identified on GP registers of people with learning disabilities. Once identified as being disabled, Tuffrey-Wijne et al (2014) reported that there is a lack of effective flagging on the person’s medical records about their need for reasonable adjustments, compounded by communication issues between primary and secondary care, and within the secondary care setting, with ‘failures to pass on information as patients moved between admissions, wards and across inpatient and outpatient departments’ (Tuffrey-Wijne et al 2014). Nurses have a significant role in identifying disabled people and their specific needs for reasonable adjustments, through holistic, person-centred assessments involving discussion with the person and/or their carers, through any records in the patient’s notes or referral letters, via any existing computerised flagging system, or through new patient registration forms. As part of a humanistic approach to nursing care, disabled people must have their need for reasonable adjustments clearly recorded in their nursing and medical records, along with a summary of the required adjustments to their care, which is available to all relevant health and social care providers. NHS Digital is exploring the acceptability and practical delivery of a nationally available flag on a person’s electronic Summary Care Record that will record if a patient has been identified as being potentially eligible for reasonable adjustments, and the specific reasonable adjustments that should be considered when providing care for that individual (Mullaney et al 2016). This will assist in identifying any disabled person who requires reasonable adjustments, but must be combined with a clear understanding about patterns of service use by disabled people to ensure that there is equitable access to services. In the examples of reasonably adjusted care outlined in this article, it was essential that healthcare professionals took time to fully understand the needs of disabled people using their service, from the disabled person’s perspective as far as possible. Healthcare professionals from the AAA screening programme met and talked with men with learning disabilities in local day centres to enhance their understanding and awareness of the issues that they experience, as well as engaging with learning disability services to develop a reasonably adjusted care pathway and policy. Eleanor’s needs were discussed at a multidisciplinary team meeting attended by those who knew her best, including her family, carers, and familiar health and social care professionals. Patient and public involvement has become an increasingly important aspect of healthcare provision over the past decade and is considered an essential driver for reform (Fredriksson and Tritter 2016). Individual disabled people may draw on their own experience, whereas disabled people in general can contribute through collective perspectives that are developed from their diverse experience. Healthcare professionals should never assume that they understand a person’s individual needs based on their type of impairment alone. For example, in Eleanor’s case, she was provided with individually tailored reasonable adjustments that other people with learning disabilities may not have required. Nurses must understand the needs of patients to ensure safe and effective care, and should aim to provide them with a positive care experience (Doyle et al 2013). Inadequate understanding of the needs of disabled people among healthcare professionals is likely to be related to a lack of consideration of their individual and collective experience. There are several methods that nurses can employ to gain an understanding of the views of patients, individually or collectively, for example through individual discussions or focus groups with patients and their families or carers, official complaints and compliments, feedback surveys, appropriate training that is focused on the needs of a particular patient group, or research evidence. The three examples detailed in this article demonstrate the importance of collaboration and coordination between health and social care professionals when implementing successful reasonable adjustments. The AAA screening team engaged with local learning disability services to develop a reasonably adjusted pathway and policy; the bowel screening programme required a coordinated approach between CCGs, community learning disability teams and bowel screening centres; and Eleanor’s care was coordinated and provided across a multidisciplinary team, and her family and carers. Disabled people, particularly those with complex needs, often require support from a range of health and social care professionals, services and sectors. Fragmented care can result in delays in the identification and treatment of illness, and, potentially, premature death (Heslop et al 2013). It can also have a negative effect on healthcare professionals’ performance (Glasby and Dickinson 2014). One of the professional standards of practice in The Code: Professional Standards of Practice and Behaviour for Nurses, Midwives and Nursing Associates (Nursing and Midwifery Council 2018) is ‘working cooperatively’. This requires nurses to maintain effective communication with colleagues, keep them informed when sharing the care of patients with other healthcare professionals, and share information that identifies and reduces risk. Such collaboration and coordination focuses on the holistic needs of an individual, with the person at the centre of nursing practice, and uses a humanistic approach to nursing that meets a patient’s needs in a comprehensive and efficient way. Nurses must ensure that all patients receive effective care. The Equality Act 2010 requires healthcare providers to provide reasonable adjustments for disabled people to ensure that they are not disadvantaged when accessing healthcare. The examples discussed in this article illustrate how three services in England embedded the provision of reasonable adjustments for disabled people at both system-level and in relation to individualised care. Each of these services identified disabled people using their service, and considered and recorded the specific reasonable adjustments required. They collaborated and coordinated the provision of reasonably adjusted care by communicating effectively with other health and social care providers, working together as a team, and treating disabled people as individuals. It is essential that all healthcare professionals, including nurses, are confident in anticipating and supporting the holistic needs of disabled people to reduce the health inequalities that they experience. Ali A, Scior K, Ratti V et al (2013) Discrimination and other barriers to accessing health care: perspectives of patients with mild and moderate intellectual disability and their carers. PLoS One. 8, 8, e70855. doi: 10.1371/journal.pone.0070855. Dinsmore AP (2011) A small-scale investigation of hospital experiences among people with a learning disability on Merseyside: speaking with patients and their carers. British Journal of Learning Disabilities. 40, 3, 201-212. doi: 10.1111/j.1468-3156.2011.00694.x. Doyle C, Lennox L, Bell D (2013) A systematic review of evidence on the links between patient experience and clinical safety and effectiveness. BMJ Open. 3, 1, e001570. doi: 10.1136/bmjopen-2012-001570. Emerson E, Madden R, Robertson J et al (2009) Intellectual and Physical Disability, Social Mobility, Social Inclusion and Health. Centre for Disability Research, Lancaster University, Lancaster. Fredriksson M, Tritter JQ (2016) Disentangling patient and public involvement in healthcare decisions: why the difference matters. Sociology of Health & Illness. 39, 1, 95-111. doi: 10.1111/1467-9566.12483. Gibson J, O’Connor R (2010) Access to health care for disabled people: a systematic review. Social Care and Neurodisability. 1, 3, 21-31. doi: 10.5042/scn.2010.0599. Glasby J, Dickinson H (2014) Partnership Working in Health and Social Care: What is Integrated Care and How Can we Deliver It? Second edition. Policy Press, Bristol. Greenhalgh T (2018) How to Implement Evidence-Based Healthcare. Wiley Blackwell, Chichester. Heslop P, Blair P, Fleming P et al (2013) Confidential Inquiry into Premature Deaths of People with Learning Disabilities (CIPOLD): Executive Summary. University of Bristol, Bristol. Nursing and Midwifery Council (2018) The Code: Professional Standards of Practice and Behaviour for Nurses, Midwives and Nursing Associates. NMC, London. Oliver M (1990) The Politics of Disablement. Macmillan Education, London. Paterson JG, Zderad LT (1976) Humanistic Nursing. Wiley, New York NY. Sakellariou D, Rotarou ES (2017) Access to healthcare for men and women with disabilities in the UK: secondary analysis of cross-sectional data. BMJ Open. 7, 8, e016614. doi: 10.1136/bmjopen-2017-016614. Tuffrey-Wijne I, Giatras N, Goulding L et al (2013) Identifying the factors affecting the implementation of strategies to promote a safer environment for patients with learning disabilities in NHS hospitals: a mixed-methods study. Health Services and Delivery Research. 1, 13. doi: 10.3310/hsdr01130. Tuffrey-Wijne I, Goulding L, Giatras N et al (2014) The barriers to and enablers of providing reasonably adjusted health services to people with intellectual disabilities in acute hospitals: evidence from a mixed-methods study. BMJ Open. 4, 4, e004606. doi: 10.1136/bmjopen-2013-004606. Watson MJ (1979) Nursing: The Philosophy and Science of Caring. Colorado Associated University Press, Boulder CO.
World Health Organization (2008) Closing the Gap in a Generation: Health Equity through Action on the Social Determinants of Health. Commission on the Social Determinants of Health: Final Report. WHO, Geneva. Does bilingual advocacy improve Bengali patients’ satisfaction with cancer services? Heslop,P., Turner,S., Read,S., Tucker,J., Seaton,S., & Evans,B.Implementing reasonable adjustments for disabled people in healthcare services.Nursing Standard, doi:10.7748/ns.2019.e11172. Heslop,Pauline., Turner Sue, Read Stuart, Tucker Julie, Seaton Steve, and Evans Brian"Implementing reasonable adjustments for disabled people in healthcare services"Nursing Standard doi:10.7748/ns.2019.e11172. Heslop,Pauline., Sue Turner, Stuart Read, Julie Tucker, Steve Seaton, and Brian Evans"Implementing reasonable adjustments for disabled people in healthcare services"Nursing Standard doi:10.7748/ns.2019.e11172.